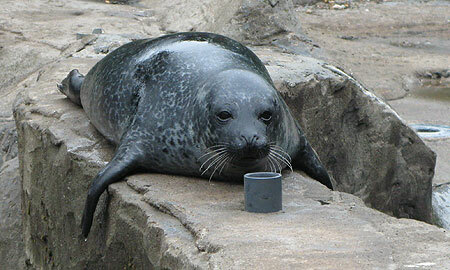 Lora was born at The Scottish SEA LIFE Sanctuary on 27th July 2007 and is the tenth pup to Lorne and Lora. Her mother, Gigha died shortly after weaning her and after a brief spell in the Weaning Pool area to ensure Lora was eating properly she quickly went back outside to be Lorne´s companion. Lora is a clever daring little girl who has decided that her favourite place to haul out is the wall between the two seal pools. When she decides to get up there it is amazing to see her jump out of the water but equally when one of the pools is drained for cleaning it is also quite worrying. The Animal Care Team are constantly worried that she will decide to investigate the drained pool! On the 1st August 2008 Lorne passed away due to old age. Lora will be monitored to ensure that she is not too stressed out by the sudden disappearance of her father. 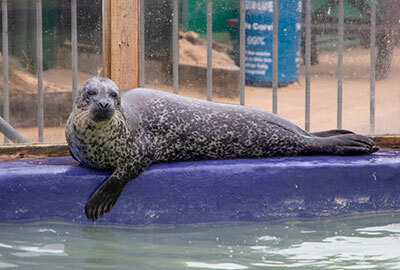 Lora stayed at The Scottish SEA LIFE Sanctuary due to a change in the law related to captive bred animals. 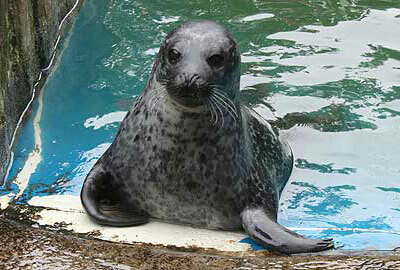 The staff are sure that she will become as good a representative of the seal community as her parents were. On 31st October 2018 the Scottish SEA LIFE Sanctuary closed and Lora along with her friends, Pippa and Macey, were moved to Hunstanton SEA LIFE Sanctuary.